Pretty In Pink Dogs: Who put this here? I must confess, it was me ... 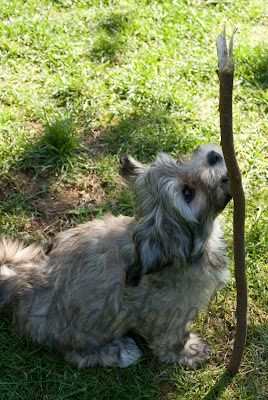 I just thought I would make it a little bit more exciting for him than just a regular stick on the ground. I saw him stand up to get the top so I had to run and get my camera to capture it on 'film'. I was gald to get these images, I find it brings out their personality a little more. What a great idea, and what a great photo! If not a negotiator, then a photographer of candid puppy moments, okay?